The Nebraska Synod is coordinating with Lutheran Disaster Response to prepare for recovery efforts following March's flooding and blizzard. You can also give online at https://nebraskasynod.org/giving/give-now.html. Click on the fourth option, "Hunger & Disaster," then scroll down the list to Hunger & Disaster, and enter your donation amount in the line for Synod Disaster Fund. Nebraskans needing property cleanup can contact the Crisis Clean Up Hotline: 833-556-2476 through April 19. 211 is a free, community resources hotline with multilingual access. You can dial or text 211 and be connected with a trained operator to help assess your needs, provide information and offer referrals to human services for your everyday needs and times of crisis. Hours are Monday-Friday 7am-8pm and Saturday 8am-5pm. Realtors Disaster Relief Effort: The Nebraska REALTORS® Association and the Home Buyer's Assistance Foundation have partnered with the REALTORS® Relief Foundation to help with mortgage payment assistance or rental cost due to displacement for up to $1000 for those affected by the Nebraska flood. More information and application on webpage. AFTER THE STORM– A Healing Book and Workbook for Children and Adults Whose Lives Have Been Affected by Severe Weather. FREE FOR FLOOD VICTIMS IN NEBRASKA AND IOWA. There will be a Multi-Agency Resource Center (MARC) in Columbus on Sunday, April 14 from 1-8pm at the Eagle's Club (3205 12th Street). A Multi-Agency Resource Center (MARC) is scheduled in Niobrara for Tuesday, April 16 from 1-8pm at the Ponca Tribal Headquarters (2523 Woodbine Road). Interchurch Ministries of Nebraska is the recipient of grant funds from Farm Aid and the Center for Rural Affairs totaling $30,000.00. Beginning April 15 they will begin taking applications for $500.00 block grants to farmers and ranchers affected by the blizzard and flooding in March. To access this assistance farmers and ranchers must complete an application by phone at the Rural Response Hotline (800)464-0258. This is a simple, straight forward application process. All applications will be reviewed by a review panel. Awards will be made within 10 days of receiving the application. Farmers and ranchers who have lost personal or household property from the blizzard or flooding are eligible to apply. For organizations looking for volunteers or those interested in hosting volunteer opportunities, please contact the 2-1-1 AmeriCorps Volunteer Coordination Team at 402-235-8262 weekdays from 7 am to 8 pm and Saturdays from 8 am to 5 pm or by email at nebraskafloodresponse2019@gmail.com. There will be a Multi-Agency Resource Center (MARC) in Lynch on Monday, April 22 from 1-8pm at Boyd County Schools-Middle School/High School Gymnasium (701 Hoffman Street). Questions & Answers about FEMA Disaster Assistance click this link. United Way of the Midlands, in conjunction with AmeriCorps Disaster Response Teams, is partnering with voluntary and faith-based organizations to host statewide flood relief volunteer opportunities. These opportunities will be listed on United Way of the Midlands’ Get Connected Volunteer Platform at this link. For flood relief volunteer opportunities, look for the white heart in the blue circle icon. For current information, volunteers can also dial 2-1-1 and press 6 to learn about flood relief volunteer opportunities. If calling from outside Nebraska, please call 402-444-6666 before pressing 6. An operator will be available to assist you weekdays from 7 am to 8 pm and Saturdays 8 am to 5 pm. *Tracking volunteer hours is crucial in the recovery process. Wherever you volunteer, please complete a Volunteer Registration Form and sign in and out to capture the total hours of service at each opportunity. 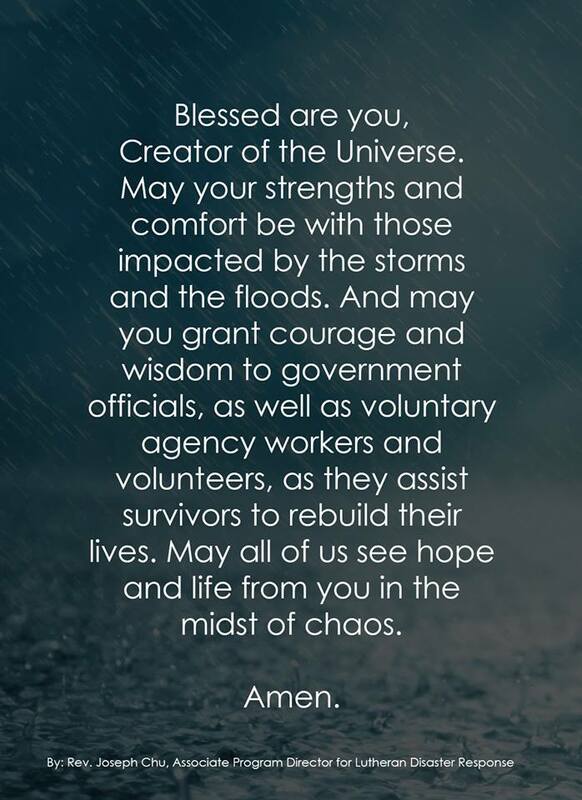 "Help us to shoulder the burden of suffering, and make us bearers of the hope that can be found in you..."
We’ve learned from partners in disaster recovery that Crisis Cleanup could use assistance in getting the word out about the Crisis Cleanup Hotline. Crisis Cleanup manages a website that improves the coordination of those who have a property impacted by a disaster with volunteers who have the capacity to help with cleanup of that property. Those who would like assistance from Crisis Cleanup are asked to call the Crisis Cleanup Hotline at 833-556-2476. This hotline will be open through April 12. Those who would like to share information about the Hotline can find flyers and social media files at this link. Hear our cry for mercy in the wake of snow, wind, and water. Reveal your presence in the midst of our suffering. Help us to trust in your promises of hope and life so that desperation and grief will not overtake us. Come quickly to our aid that we may know peace and joy again. Strengthen us in this time of trial with assurance of hope we know in the death and resurrection of our Savior and Lord, Jesus Christ. Amen. Your word of peace stills the storms that rage in our world. Bring hope to places that know devastation in the calm after the storm and flood. Bring comfort to those who grieve the loss of loved ones, animals, and property. Let your love be known through those who work to bring order in the chaos. Help us to shoulder the burden of suffering, and make us bearers of the hope that can be found in you through Jesus Christ, our Savior and Lord. Amen.